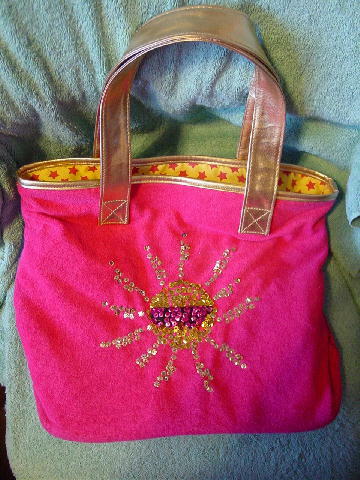 This deep hot pink soft terrycloth tote has a gold lame faux leather rim and two 19 1/2" by 1 1/4" (7" drop) handles. On the front is a freeform sun in gold sequins and magenta sequins on a black strip horizontally across the center. The interior lining is polyester and has a design pattern of red stars on a bright yellow background. 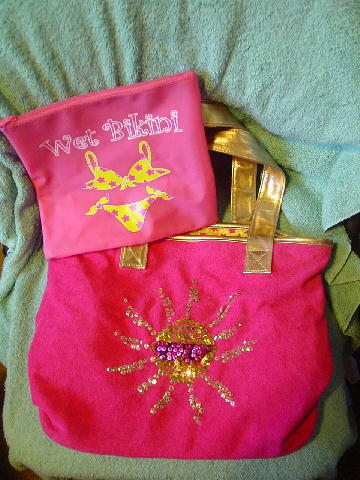 Attached to the interior upper side is an 8" by 3/8" vinyl strap attached to an 8 3/8" wide by 8" high vinyl pink zippered pouch which has on its front white and magenta-pink letters that say Wet Bikini. Below that is a yellow bikini with magenta-pink stars. 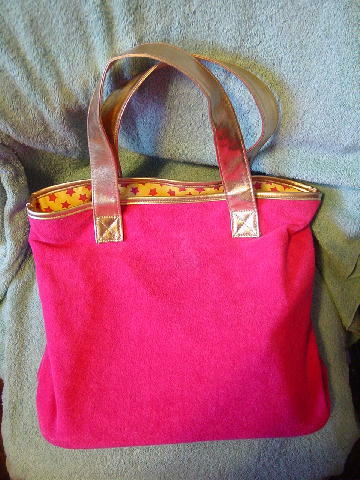 The back of the terrycloth tote is plain, but it has a lighter area outlined by a little darker area. The spot is 1 3/4" down from the rim and 2" inward from the right lame strap (It's 1 1/2" high by 1" at its widest.). 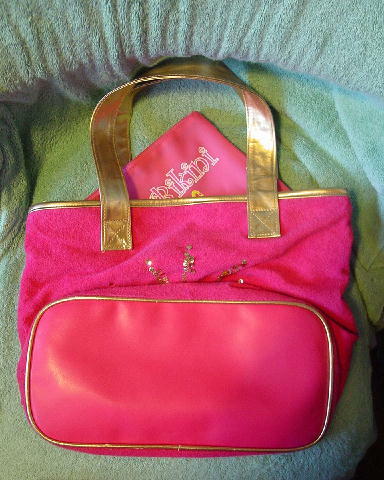 The bottom is in a dark hot pink vinyl, rimmed by gold lame cording. She used it while on a yacht in the south of France.